Where I live, we have more swans in the bay during the winter months than in the summer. Some years there have been as many as 200; a mix of permanent residents and those who have flown down from northern Ontario. Wow, that is an amazing design. I'm guessing this stamp looks even better in person. The Finnish PO has such unusual stamps, thanks for sharing this one. I would have preferred to have no cancellation marks on her, but at lest these lines are light enough to not interfere with the swan's beauty. I would have used this one to mail my Christmas cards if I was in Finland. That's a striking looking stamp. Well done. What a beautiful stamp! I agree that the cancellation marks don't detract from it - they are like waves or ripples for the swan to swim through. 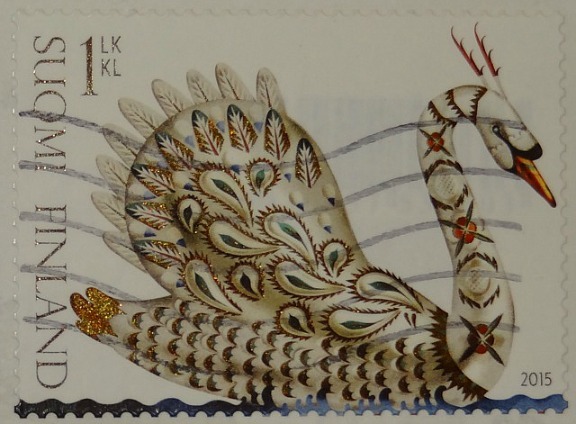 I've had one of those too, the Finns seem to like glittering stamps, must brighten up be the long dark winter days. A link to tempt me to shop!